Colors are one way that the gender of different spaces can be communicated. Pink and blue are the most identifiable, and recent research shows that men do seem to prefer blue (though, so do women). Men’s aversion from pink, however, is stronger than women’s (though it’s also true that pink can be framed as masculine for select groups of men). While this can feel timeless, like most aspects of gender, it hasn’t always been around. And even when we began assigning gender to colors, pink was not always associated with girls. Today, we think of pink as a “girl color,” and few of us would struggle if asked whether it was for girls or boys. But, the parents addressed in this publication were less sure. Apparently, these parents didn’t know what we know and, by contemporary standards, the author seems to have the colors mixed up. So, colors are capable of acquiring a gender, and when they do, framing is clearly key. This issue is dramatically highlighted in a recent advertising campaign by CIL paints. 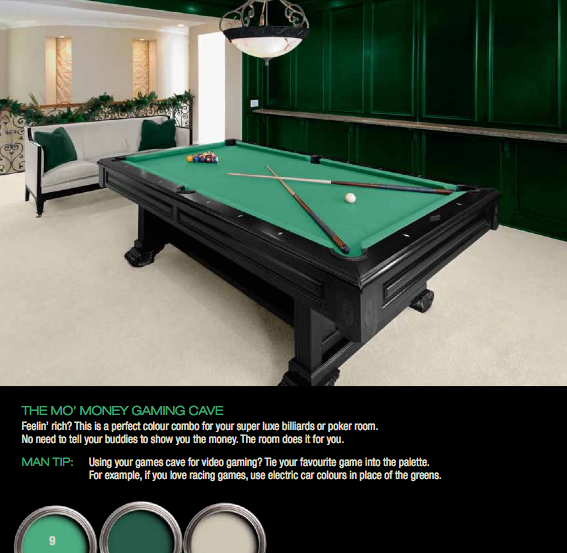 The campaign is entitled “Paint Chip Names for Men” and it was accompanied by a pamphlet—CIL Ultimate Man Caves—that listed the actual names of CIL paint colors along with a “manly name” (like switching a dark tan from “Monterey Cliffs” to “Wolfden”) along with a series of images of different kinds of man caves. Because the home is the most common place of paint application, it is important to consider the CIL pamphlet as literature that is in conversation with the broader context of the division of household labor. The home is a context in which gendered assumptions concerning proper masculine and feminine behavior are both produced and reproduced. The campaign is premised on the notion that paint color names are emasculating. The campaign endeavors to joke about this by dramatically highlighting how the same color can be interpreted in different ways simply by masculinizing the name. The campaign was also accompanied by an extended video with a CIL representative asking couples to respond to colors (below). She presents a couple with an enlarged paint swatch accompanied by a color name that we are supposed to recognize as feminine, the couple reacts, and then she flips the swatch over revealing the same color (although couples assume it is a slightly different version of the same color) with a different, more “masculine” paint name. For instance, she presents one light purple as “ballerina slipper” and we watch men cringe and say that the color is “not for them,” and then presents the same color as “skin around scab.” Sometimes the names are meant to evoke disgust, but sometimes they’re just associated with “masculine” activities (like “ninth hole”). 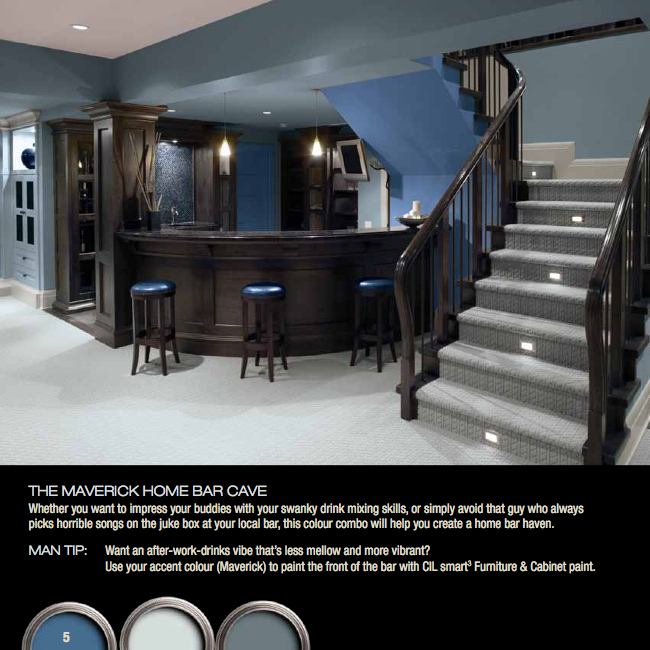 The Man Cave Pamphlet begins with an image of a cave painting, stating “Since the dawn of time…” you flip the page and it continues, “Men have been decorating their caves.” This reliance on universalizing narratives about men and masculinity have been thoroughly discredited as have the biologically deterministic models that attempt to explain gendered differences in behavior as genetic in origin (see Martha McCaughey’s The Caveman Mystique for a great critique of these explanations). Despite all of this, Home Depot’s advertisement works because we’re all invested in these ideas and framings. 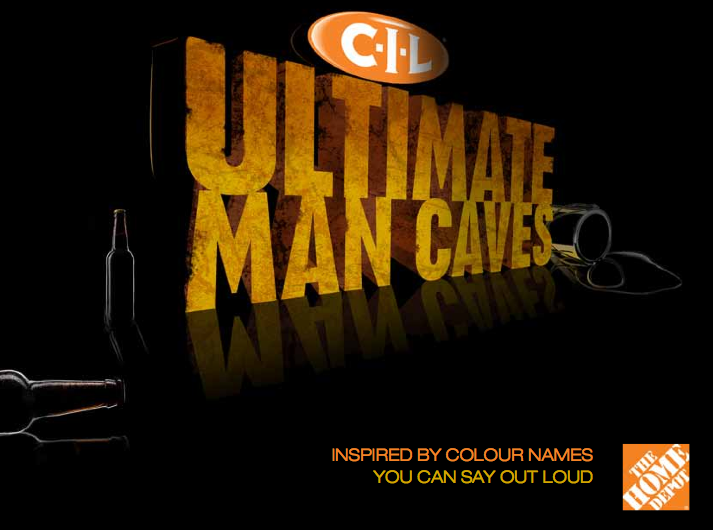 CIL’s campaign subtly reinforces this divide through the naming of their man cave paints. Instead of participating in the feminine venture of shopping for “tracery,” CIL attempts to (jokingly) masculinize paint in order for men to enter this realm without risking emasculation. It’s not that these colors are actually masculine or feminine. Colors are capable of carrying a diversity of meanings depending upon how we represent them and make meaning with them. In fact, the cultural association of pink with femininity wasn’t really firmly established until some time between 1920 and 1940. Indeed, “pink” was not even always a color recognizably distinct from red. The word pink comes from a flower colloquially referred to as “pinks” less for their color and more for the jagged edges of the petals. They were called this because “pink” was used more commonly used as a verb that meant something like decorating with perforated edges (this is why we call them pinking sheers). The CIL paint campaign is a great example of how our collective investment in understanding gender and gender differences as natural and timeless is often casually presented in ways that reinforce our belief in that fiction. *Peter Rydzewski is sociology major at The College at Brockport, State University of New York. He is currently in the process of applying to study sociology in graduate school next year. His research interests surround gender and sexual identity and inequality with a particular focus on families and workplaces. Great post. Even as an art history student, and someone who considers himself rather open-minded, and decidedly against the dominant discourses of machismo, I’m not sure I ever really considered how the names of colors influence our perceptions of them. I may be the kind of guy who has absolutely no problem with lavender or seafoam green, but, you (and CIL) are absolutely right that if we took the exact same color and called it something different, I would feel differently about it. So, thank you for this great post. I am a bit confused, though, as to whether the CIL commercial is reinforcing gender stereotypes, or is helping combat them….